It also consists of 802.11b/g/n, 5-megapixel rear-facing camera, 2-megapixel front-facing web cam. Introducing the first Android touch tablet from Motorola. With a brilliant 10.1-inch display optimized for high definition video in true 16:9 widescreen format, Motorola XOOM provides a whole new media experience for mobile uses. With a dual core chipset, everything moves faster: web browsing, video playback, gaming. Native support for both front and rear cameras provides easy access to either one. The addition of a gyroscope, along with a powerful graphics engine and built-in hardware acceleration, elevates game design to a whole new level. Motorola XOOM pushes the boundaries and opens a whole new world of what's possible. 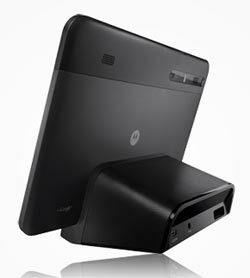 Dual-core processing, Android 3.0 Honeycomb platform, and 10.1-inch HD multi-touch display (see larger image). Front-facing camera for video chats, and rear 5-megapixel camera for HD 720p video capture (see larger image). It runs Google's Android 3.0 Honeycomb operating system, which offers a multi-touch, holographic user interface that improves on Android favorites such as widgets, multi-tasking, browsing, notifications and customization. It also offers the latest Google Mobile innovations, including Google Maps 5.0 with 3D interaction, access to over 3 million Google eBooks and Google Talk with video and voice chat. The Motorola XOOM features a front-facing 2-megapixel camera for video chats over Wi-Fi via Google Talk, as well as a rear-facing 5-megapixel camera (with LED flash for stills) that captures video in 720p HD. The 10.1-inch display delivers console-like gaming performance on its 1280 x 800-pixel display, and it features a built-in gyroscope, barometer, e-compass, accelerometer, and adaptive lighting for new types of applications. Other features include a 32 GB internal memory, memory expansion via optional microSD cards (with future software upgrade), 802.11 a/b/g/n Wi-Fi networking, Bluetooth for hands-free devices and stereo music streaming, access to personal and corporate e-mail, HD 1080p video playback, HDMI output for connecting to a compatible HDTV or monitor, and a 3250 mAh battery for up to 10 hours of Wi-Fi internet browsing. Specifically optimized for devices with larger screen sizes such as tablets, the Android 3.0 platform (dubbed Honeycomb) introduces a brand new, truly virtual and "holographic" UI design. With five customizable home screens, you can easily access your favorite live widgets or application shortcuts. Each screen features a familiar launcher to access to all installed applications, as well as a Search box for universal search of apps, contacts, media files, web content, and more. Multitasking in Android 3.0 is easier than ever, and you can use the Recent Apps list in the System Bar to see the tasks underway and quickly jump from one application context to another. You'll even see a snapshot of the last screen viewed in that app as a visual reminder. The Android onscreen keyboard has also been redesigned to make entering text fast and accurate on larger screen sizes. 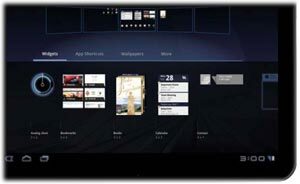 Scrollable and stacked widgets let you scroll or flick through content within the widget itself, on the home page, without opening the application. Unobtrusive notification system displays icons for different notifications (messages, downloads, system updates, etc.) in the lower right corner. Just touch the digital time display to open the entire notification panel. Redesigned YouTube application with a cool 3D gallery. Android Market for Android 3.0 is your one-stop-shop for eBooks, games, and applications. 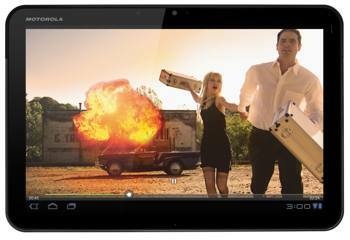 The Motorola XOOM has a wide range of optional accessories to expand its power and capabilities. The "smart docks" are no longer just a place to charge your device; they make Motorola XOOM a portable play and work station that fits your lifestyle. The Standard Dock can be used for watching video content or listening to music through external speakers as the device charges. The Speaker HD Dock allows you to send HD content directly to your TV or blast your tunes without attaching external speakers. Onboard GPS for navigation and location services. Integrated Google Maps with turn-by-turn navigation, street, satellite, and three-dimensional landscape views. Video chat on Google Talk with any other Google Talk-enabled device (smartphone, tablet, or PC). Access to personal and corporate e-mail (including support for Exchange and push Gmail). Desktop-like web browser (HTML5-based Android Webkit) with tabbed browsing and Chrome bookmark sync. Memory expansion via microSD card slot with support for optional cards up to 32 GB (functionality requires future software upgrade). HDMI audio/video port enables you to output pictures, slides and videos in HD quality (1080p) via HDMI cable (sold separately). Data encryption ensures the privacy and security of data on your tablet. 5-megapixel rear-facing camera for optimized resolution when capturing photos on the go. Includes dual-LED flash, auto-focus, and digital zoom. 2-megapixel front-facing web cam for video chats. Includes indicator light when used. Instantly upload video to sharing sites or view and edit on the fly. 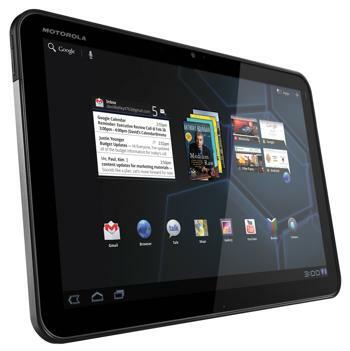 The Motorola XOOM weighs 25 ounces and measures 9.8 x 6.6 x 0.5 inches. Its 3250 mAh lithium-ion battery is rated at up to 10 hours of video playback, up to 10 hours of Wi-Fi web browsing, and up to 3.3 days of MP3 playback. Read more than 700,000 Kindle books with our free application. Find, buy and play the music you love wherever you are. Shop for millions of products wherever you go. Connect to the world's largest collection of movie, TV and celebrity information.